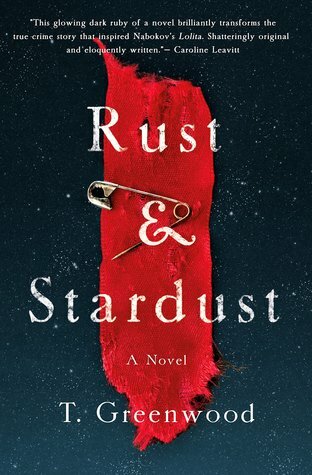 Rust and Stardust is the story of Sally Horner, an 11-year old girl who was kidnapped by Frank La Salle in 1948. T. Greenwood took the true facts of the case and used them to spin a story of what may have happened to young Sally in the years she was forced to travel across the country with La Salle. This story is gut-wrenching, heartbreaking, and at times very hard to read. It is told in many points of view, from Sally, to her mother, to the various people Sally meets along the way. There are no words to describe the utter heartbreak I have after finishing this book. Sally is such a strong character, a strong person, and one that has definitely left an impression on me. I’m impressed with the way T. Greenwood has taken such a serious and awful subject and found a way to tell Sally’s story in a delicate and non-graphic way. Though I’ve added the trigger warnings above, the author does not spell out the terrible scenes in a graphic detail, but uses more of a fade-to-black method. I have children of my own and my heart aches for the families that have had to go through something like this. This seems like a very melancholy review, but if you’re at all interested in Sally Horner’s kidnapping, I encourage you to read this book and then do some of your own research into the case. Thank you to St. Martin’s Press and NetGalley for sending me a copy of this book to review. It’s been years since I last read something similar and it sounds so different from what I usually read which is exactly what I need. I think I’m definitely getting this book because of how good and different it sounds. I’m glad I read this review because before this I hadn’t heard of this book. Yay! I’m so happy to help! It’s hard to say I enjoyed this story because of the terrible things that happen, but the author does a really great job of telling this story. I was going to get it but then I saw the prices and I died a little. I really want to read it but I’m a college student without a job. I’ve been seeing this book everywhere and I don’t think I could emotionally cope with reading it. It is pretty heavy, but I really think the author did a great job of telling Sally’s story and being delicate where it was necessary. The trigger warnings were definitely needed, but I still thought it was a well told story.